The windmill looks very handsome in this light, Astrid. 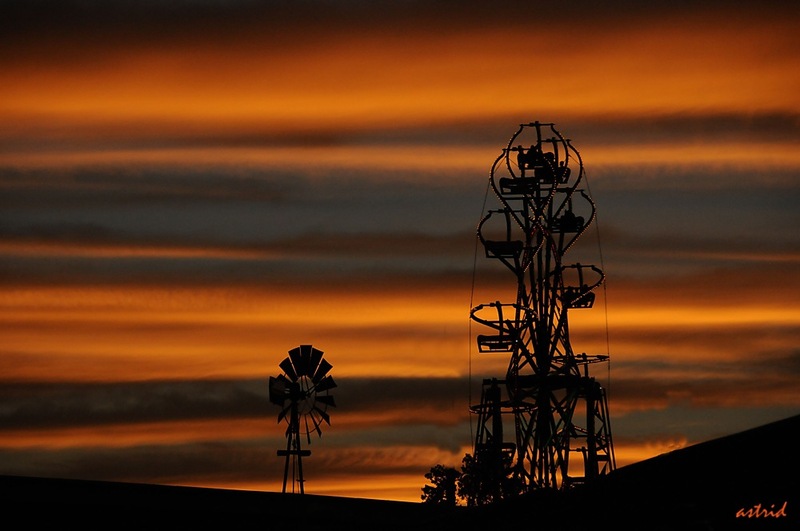 Picturit: The American windmills are also very pretty as a silhouette. Picturit: Thank you so much, it was an incredible sunset. Picturit: Thank you, sometimes you get lucky with the circumstances. That would be a good time to be on a ferris wheel with a camera. Picturit: Thank you Peter, it was one of those rare magic evenings and finally we were IN it in a great surrounding. Thank you for your likey. Whoo - this is wonderful Astrid! Picturit: Thank you Chris, it was one of those special sunsets, I never experienced one like that before. An American windmill! And with the ferris wheel, it could hardly get better. Will we ever be able to top this 2014 fair, I wonder??? This is so splendiferous, MLMA. Picturit: This was the most beautiful sunset I ever experienced. Being at the fair was a treat and this was the big finale. Thank you, mijn lieve schat. I doubt that we will ever top this one evening. een geweldige foto - en heeeeeeel mooi! Picturit: Dank je wel Philine, het was een zeldzaam mooie avond. A lovely picture Lady P.
Super Astrid, what a sunset. Picturit: This was something I hardly ever saw, so intense all those wonderful colours. This is a work of art, Astrid! Picturit: Thank you Lisl, for your kind words. The lights and shapes on the ferris wheel are a true delight. Awesome shot. I rate this as one of your very best pictures Astrid. Picturit: We had an amazing sunset, it was so beautiful, I almost forgot to take pictures. Picturit: ....and straight from the camera, that sky was amazing. i love the smooth bands of the clouds and what colours! Picturit: Thank you ayush, one of those rare and special evenings. I think you took a paint brush to this Astrid... or Mother Nature sure did. Very good. Picturit: Thank you kindly, one of those places you are at the right time. So lucky here.